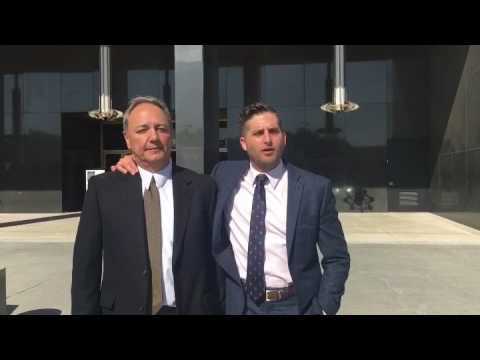 This is Andrew Leventhal, Esq., and his client, outside the Norwalk Courthouse, after a major victory. Mr. Leventhal’s client wanted to give a video testimonial about his experience with THE LEVENTHAL FIRM. This gentleman was accused of firing a glock at a passerby motorist on the freeway. He was facing PC 245(b) (and a special PC 12022.5 allegation), PC 246 & PC 417.3, all serious felonies alleging the use of a firearm upon another person. The maximum exposure here was 19 years in prison! Mr. Leventhal hired a firearms expert and a psychologist to attack the allegations in this case. He also filed countless pre-trial motions challenging the prosecutor’s theory of the case. Mr. Leventhal’s dedicated defense work paid off. THE LEVENTHAL FIRM leaves no stone unturned and will fight tooth and nail to make sure that everything that can possibly be done, is done. No regrets with THE LEVENTHAL FIRM. At the sentencing hearing, the prosecutor argued for several years in prison while Mr. Leventhal argued for time served (no incarceration whatsoever). Mr. Leventhal and his team prepared a massive sentencing memorandum for the court to consider at this hearing. This filing paid off tremendously, because at the end of the day, THE LEVENTHAL FIRM prevailed and brought this man home to his wife and kids. The Pasadena and Los Angeles criminal defense attorneys at THE LEVENTHAL FIRM live for moments like these.